The Sterling Firm is committed to helping seriously injured victims obtain justice by fully maximizing settlements and verdicts. The Sterling Firm is committed to serving business entities, business owners, and professionals in transactions, disputes, and litigation. The Sterling Firm provides experienced Legal Counsel and is committed to helping clients involved in the Entertainment & Media Industries. If you want to obtain a money judgment, if you are involved in litigation, or if you have a transaction that requires the attention of Legal Counsel, The Sterling Firm is your solution! The Sterling Firm is a full-service civil litigation and transactional law firm concentrating on Personal Injury, Business Law, Entertainment Law, & Media Law. The Sterling Firm is dedicated to helping clients obtain maximum compensation, achieve cost-effective legal solutions, and resolve legal conflicts efficiently. The Sterling Firm provides legal services in cases that range from personal injury lawsuits to complex business transactions and intellectual property infringement lawsuits. Flexible billing options are available, including: Flat, Capped, Equity, Hourly, and Hybrid Fee Agreements. 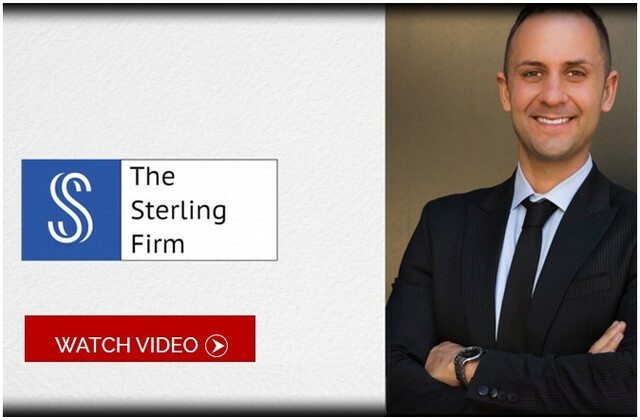 Please contact The Sterling Firm to arrange an Attorney-Client Agreement. The Sterling Firm accepts Personal Injury matters solely on a Contingency Fee basis, which means unless the client obtains a recovery there will be no Attorney Fees charged. No Recovery, No Fees! This website should be used for informational purposes only. The information contained within this website does not constitute legal advice or other professional advice. An Attorney-Client relationship has not been formed until a Attorney-Client Agreement is signed by the client and The Sterling Firm. Free Consultations are generally offered by The Sterling Firm for the purpose of evaluating the propriety of the particular matter and to provide fee quote. The Sterling Firm does not provide legal advice during Consultations.